On Monday evening, he succumbed to a liver inflammation. 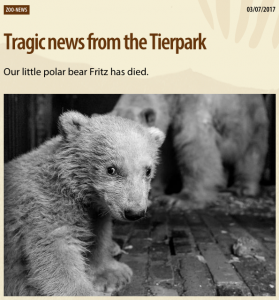 Vet Dr Andreas Pauly and keeper Jeane Falkenberg were tending to the sick little bear in the Tierpark’s clinic. At around 7:30 p.m. Fritz’s breathing became irregular and the vet administered a respiratory stimulant. Fritz was also given oxygen and a cardiac massage, but unfortunately none of those measures helped. At 8 p.m. he was declared dead. Copyright © 北極.net All Rights Reserved.